Do you really need a liferaft? Well, if you are out in water over your head, you certainly should consider having some alternative to your boat! Many small cruisers and sailboats do not even carry a dinghy, or if they do, it is stored in such as way as to be useless in most “abandon ship” situations. On striking an object, a boat can fill and sink in just a few minutes. Fire is another very real risk on a small boat. Do you have an “abandon ship” plan? Since the point of this article is to consider whether or not you should invest in a liferaft, I’ll concentrate on coastal and small vessels rafts. If you are planning an offshore passage and aren’t absolutely certain you need a liferaft, I’d suggest you just stay at home. How far can you swim in cold water? On September 4th of this year, hurricane Earl made landfall near Halifax; there was one fatality. A marine business owner having secured a boat on its mooring decided to swim the short distance to shore. The water was choppy but not particularly cold (at least by Nova Scotia standards), yet after a short time he was seen from shore to be experiencing difficulty and sadly drowned before anyone could get to him. In this case he shared some aspects typical of people who suffer “swimming failure”: he was healthy, a good swimmer and close to shore. The waters of the Great Lakes, particularly the popular boating areas of Lake Huron and Lake Ontario warm up to reasonable temperatures during the summer months, but at the beginning of the season, while the air may be warm and inviting, the water is still very cold. In spite of the risk, people confidently venture into deep water in small craft, often without even a dinghy on board. According to Transport Canada (1), a lightly dressed person will last one hour in 5°C, two hours in 10°C and six hours in 15°C and that’s assuming you can stay afloat. Long thought to be the “just a requirement of offshore sailors”, a modern liferaft is really a basic piece of safety equipment. The technology of liferaft design and construction is constantly evolving and there are a number of places to review the relative merits of different designs vis à vis ballast, drogues, etc. However, the main consideration for asmaller inshore craft is more likely storage and cost. The fully S.O.L.A.S. 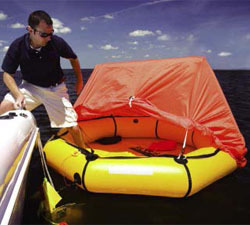 – Safety of Life at Sea (2) – compliant liferaft is a heavy and bulky thing. Too often, they are stored in a manner that would make launching difficult or even impossible in some extreme situations. There is no doubt that the offshore raft is the best survival option and if you have the space and don’t mind the cost, there is no reason not to have the best. However if space and cost are a factor, as they are for most people, then we should look at some of the basic coastal rafts and what they do offer. Here again the location and length of your boating season are major factors. On the east and west coast, the waters stay cool to cold for the summer and an open raft, while it is better than nothing, will still leave the occupants exposed to wind and waves. Hypothermia becomes a very real concern. In warmer inshore waters, however, an open raft may do the trick. There continues to be much discussion as to the merits of different liferaft designs. The main differences are over the proper amount of ballast. Water ballast is held in bags below the raft and a heavily ballasted boat will resist capsize and excessive drift, but in extreme conditions may be damaged by their inability to slide away from the wave face. Lighterballasted boats are therefore more prone to capsize. In the waters we are concerned with here, it is likely one would choose a coastal style raft and most of these have little ballast. The most basic raft is usually open with a single tube. The “Coastal Compact” from Revere is an example of the simplest style raft. Revere also offers the “Coastal Elite” with a small canopy. Winslow Liferaft Company makes an extensive range of serious offshore rafts; however they also offer their “RescueRaft™” and the “DualShore™” with twin tubes. Both of these are open rafts with boarding ladders and optional (but important) 75’ trailing/heaving lines. Many companies label their rafts as coastal but there is a wide variation infeatures and style. While some coastal rafts weigh in at up to 100 lbs., others are as little as 20 lbs. for the most basic model. Compare the specifications and consider just when and how you may need to deploy the raft. Having a raft is just the first step. The next is locating the raft where it can be easily retrieved and launched. Remember you may have to get the raft overboard in a very short time. Lockers are obviously the worst place, but also consider the style of the boat. A modern express cruiser may have an inviting location on the broad swim platform. However, the boat will most likely sink by the stern and in the event of fire the stern may not be accessible. Go through the liferaft launch scenario and select the safest location, not the most aesthetic. In the case of smaller boats, the valise type containers used on many inshore rafts can be stored below and brought out to the helm area when the boat is offshore. So, do you really need a liferaft? Unless you always operate your boat alone, you are responsible for the lives of friends and family who are aboard. Shopping for a suitable liferaft is a bit like buying insurance in that we’re spending money for something we hope not to need. Boaters will often spend large sums on the latest electronic navigation device yet resist the expense for a potentially lifesaving piece of equipment. (1) A detailed discussion of the dangers of cold water can be found in a Transport Canada report “Survival in Cold Waters” TP13822E. You can find it at www.tc.gc.ca (2) The International Convention for Safety of Life at Sea or S.O.L.A.S. dates back to the Titanic disaster. SOLAS has been updated over the years and is the international standard for offshore commercial safety equipment such as liferafts, lifeboats and lifejackets.